Photograph (c) 1999 by David Jensen, Alaska Pet-Ography. All rights reserved. 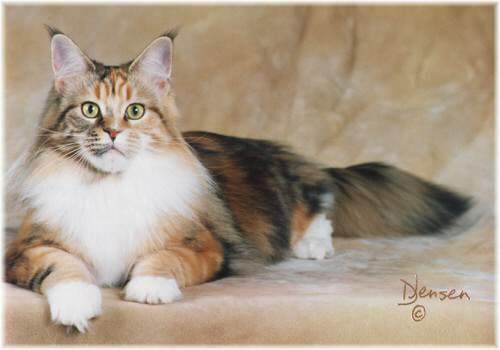 Torri is a magnificent brown classic torbie and white girl, with great size and boning and a long, hard body. Torri has a beautiful head with a long square muzzle, a good profile (has a slight nose bump), and a deep square chin. She has huge ears with large, thick lynx tips. She earned her SGC as a whole cat (in just four shows! ), took time off from her show career in order to have babies, and returned to showing soon after being spayed. Torri loved going to shows -- she loved all the attention and activity, not to mention all those neat toys the judges have. Torri has a wonderful, goofy personality both at home and in the show hall. She is extremely outgoing and virtually unflappable, and enjoys pretty much everything (except baths and brushing, which she just barely tolerates). She's fearless, friendly and likes to be involved in everything. She loves to "chat" with us, and can keep up her side of the conversation for minutes at a stretch. Torri is very affectionate and purrs almost constantly. Torri now lives alone with her new owner, Lynne Lamb. She had been having almost constant disagreements with our other cats regarding her status as Reigning Monarch Of The World. Now, as an only cat, Torri is much happier; she is, we are told, uncontested queen of all she surveys. Health notes: Torri's heart is sound (checked at the age of 2 1/2 by a board-certified cardiologist). Her hips were borderline at 1 year of age and mildly dysplastic at 3 years, which is why she is now spayed. Even so, she continues to be a very active and agile cat who can still leap effortlessly to the top of the fridge (or wherever else looks interesting).